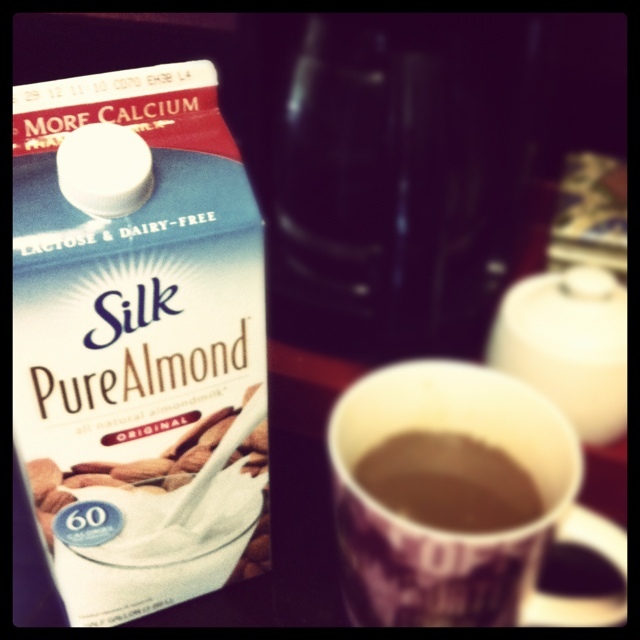 I LOVE LOVE LOVE almond milk. It’s the only kind of milk (other than “mama moolk”) he drinks. Other than the limiting of dairy, by not drinking cow’s milk you decrease mucus production and the inflammatory response in your body. So, you are really doing your body (as well as soul and mind) a favor by not drinking “regular” milk! Keep it up! I thought of you just now…we were out and about and the hubs thinks that Dunkin Donuts would be a good, fast snacky breakfast. Maybe for him and the boy, but you can imagine my thoughts. He said, “Just get coffee.” So, I figured, sure…why not?! Mis.Take! Talk about blah! I, too, have come to enjoy almond milk over the last few months. However, over the last week I have only used that and minimal sweetener in my coffee at home. It was all I could do to stomach my “usual” from DD! Oooooooo! The changes!!! But there are not a lot of things worse than a “blah” cup of coffee… you should get an EXTRA cup at home WITH almond milk!!! haha! And I have another yummy recommendation that I got from my friend “Rhonda” that I’m going to post about but I’ll give you a sneak preview (you might already know about it though)… SweetLeaf Liquid Stevia, Apricot Nectar… you drip like five drips into your iced tea (or an assortment of other things) and it makes it like this perfect balance of sweetened and flavorful without being overpowering! She gets it at Sprouts and they have other “flavors” also at Whole Foods!